Imagine your event headlined by Frankie Valli & The 4 Seasons. How much buzz would booking Frankie Valli & The 4 Seasons bring to your event? GTB helps customers Book VIP Shows, Corporate Events, & Private Engagements with top talent for hire. GTB represents clients as they book talent like Frankie Valli & The 4 Seasons for their event. Click to start The Event Booking Process with Frankie Valli & The 4 Seasons. Originally formed in 1960 in Newark, New Jersey, Frankie Valli and the Four Seasons is an American pop and rock band that is currently signed to Curb Records. They have been a force to be reckoned with in the music industry for over 50 years, while they specialize in the musical genres of pop, rock, and blue-eyed soul. The band has cycled through quite a few members over the years, and currently consists of Frankie Valli, Brian Brigham, Brandon Brigham, Todd Fournier, Keith Hubacher, Gary Melvin, Landon Beard, and Robbie Robinson. The band has sold over 100 million units worldwide, making them one of the top selling music group in history. Frankie Valli and the Four Seasons have won various awards and achievements for their work, and in 1990 they were inducted into the Rock and Roll Hall of Fame, and in 1999 they were inducted into the Vocal Group Hall of Fame. They continue to tour all over the country, entertaining fans and music goers with their unique vocal style and delivery. 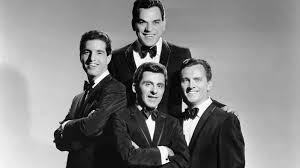 Since first breaking out on to the music scene in 1960, Frankie Valli and the Four Seasons have released over 20 full length studio albums, as well as a large catalogue of compilation albums and singles which are adored by their fans and music critics alike. They have cultivated a large group over very loyal fans and followers while their music videos have been viewed millions of times online, including their video for the song “Rag Doll” which has individually racked up over 3 million views on YouTube. It seems that the sky is the limit for the ever-growing success of Frankie Valli and the Four Seasons, as their popularity and fan base continue to grow exponentially larger by the day, and they continue on their pursuit of the American musical dream. Click for Frankie Valli & The 4 Seasons Event Booking. Start booking Frankie Valli & The 4 Seasons now! GTB is a celebrity talent booking agency for paid events. We do not handle media requests, or interviews. GTB will not relay messages to Frankie Valli & The 4 Seasons or solicit donations on your behalf. While celebrities do donate their time, they will always charge some kind of fee to do any event, project, venue or celebrity appearance. Booking Frankie Valli & The 4 Seasons Not Quite Right? We have the entertainer for your Event! Putting together a memorable event isn't easy. Booking Frankie Valli & The 4 Seasons certainly raises the profile of your show or event. GTB is ready to help you make the event flawless, so your attendees remember Frankie Valli & The 4 Seasons instead of a mix-up. Private Parties, Concerts, Ceremonies, and any other big events require both planning and personnel; Global Talent Booking can help you every step of the way, from booking to advertising a public Frankie Valli & The 4 Seasons event. Should you prefer a private Frankie Valli & The 4 Seasons showing, Global Talent Booking has the tools, connections, and expertise to help you manage a velvet roped evening, elegantly! Global Talent Booking has worked with exemplary talent for over 15 years. Booking Frankie Valli & The 4 Seasons and other world class entertainers is our expertise. From private concerts featuring some of the most famous names in the music industry to corporate events DJed by the best in the industry, we excel at showcasing your image. GTB is ready to help you book your favorite musicians, djs, and celebrity talent; creating memorable entertainment experiences is what we do everyday. Global Talent Booking Agency services help you with event talent booking. Our services include talent scheduling, contract negotiations, marketing/promotions, agent and/or agency interaction, and so much more. We can help you book Frankie Valli & The 4 Seasons, advertise a public event or help you manage the guest list. Our event booking services can even include the press work after your Frankie Valli & The 4 Seasons event. Global Talent Booking is here to help you mind the details so your event with Frankie Valli & The 4 Seasons is `World Class` the first time, each time, and every time. Our entertainment agency will work with you to put the right talent in the right situation world wide. Global Talent Booking is an International talent booking agency. If you are interested in an international Frankie Valli & The 4 Seasons event booking, click here to get started. We know what it takes to organize events that exceed everyone's expectations, no matter where they are in the world. We look forward to helping book your`s. Click to Start Booking Frankie Valli & The 4 Seasons. Celebrity Talent, like booking Frankie Valli & The 4 Seasons, makes all the difference. Contact our Expert Frankie Valli & The 4 Seasons Booking Agents. We are ready to help you start coordinating your Frankie Valli & The 4 Seasons event immediately.